If you plan to build a number of these frames, we suggest you make a hardboard template for the frame and stand. Sturdy templates will make quick work of drawing the frame pints to size again and again. 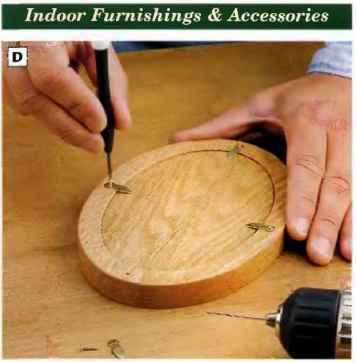 O Transfer full-size copies of the frame and stand layout patterns shown on page 181 to your hard-board. We enlarged the patterns on a photocopier, cut them out and used spray adhesive to stick the patterns to the hardboard. Scroll-saw the templates to rough size, cutting just outside your layout lines. Smooth the edges of the patterns on a drum sander, if you have one. © Cut the frame to shape. First crosscut a 7-in.-longblank for the frame from your %-in. oak stuck. 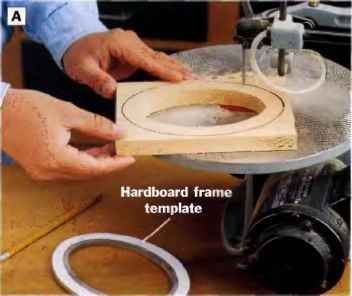 Use the hardboard template for the frame to trnce the part onto your oak blank, then cut out the frame on the scroll saw or with a jig saw (See Photo A). Sand the cut edges smooth on the drum sander. 0 Chamfer the inside edges of the frame: Install a piloted 45" chamfer bit in your router, set the hit for a M-in.-deep cut, and rout a decorative chamfer around the inside edge of the frame (See Photo B). 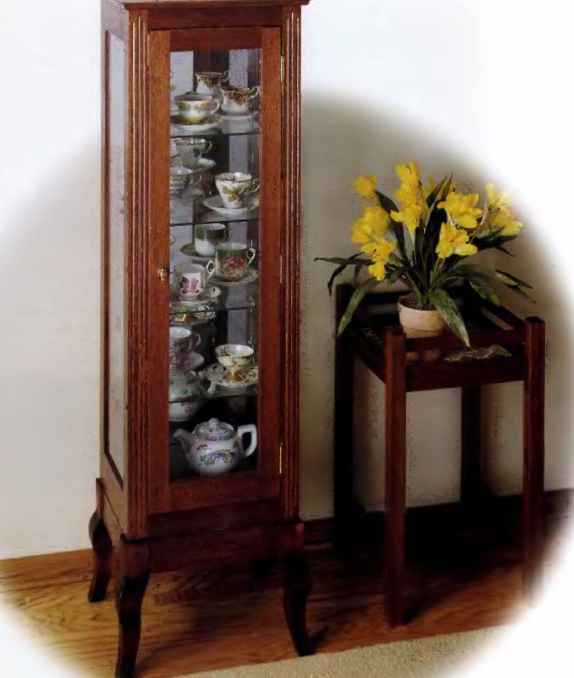 If you want to mill a decorative profile on the outside of the frame as well, this is the time to do it. Guide the router counterclockwise around the workpieee. © Cut a rabbet into the back of the frame for the glass and back panel. You'll make this cut in two passes. For the first pass, install a 34-in. piloted rabbeting bit in your router and cut a Va-in.-deep rabbet around the inside edge of the frame back (See Detail: Frame drawing, page VS1). Then reset the bit depth to 3/8 in. and make a second pass around the frame to finish up the rabbet. PHOTO A: Draw the frame shape onto %-ln. oak stock, then cut out the frame on the scroll saw. We made a hardboard template to trace this shape and to keep on hand for making more frames. Drill a starter hole for the blade In order to cut out the center of the frame. PHOTO B: Mill the 45° chamfer on Hie inside edge of the frame with the router held free-hand. 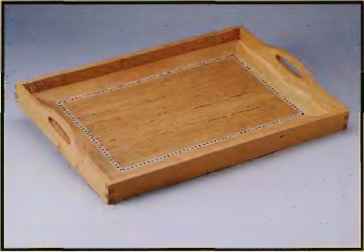 Use a non-slip pad beneath the workplece while you rout Then turn the frame over, switch to a VHn. piloted rabbeting bit and rout the back rabbet around the Inside edge. drawing, page 181, to determine the orientation of these bevel cuts. Your goal here is to trim just enough m;iterial off the ends of the blank Lo form the bevels. 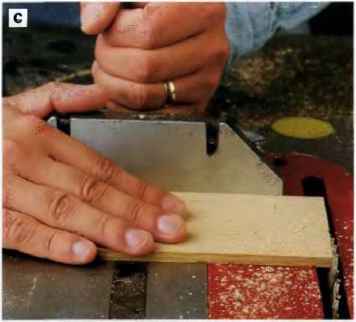 Then use the hardboard pattern to trace the shape of the stand on your blank and cut it out on the scroll saw. 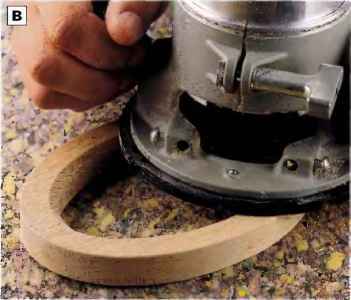 Smooth the cut edges on the drum sander. PHOTO D: Four brass turn buttons hoid the glass, photo and back in the frame, install the hardware so the turn buttons are spaced evenly around the frame. Drill pilot holes for the tiny turn button screws. PHOTO E: After locating the hinge position, mount the hinge to the frame back with #4 x Va-ln. brass flathead wood screws. Fasten the hinge to the stand with bolts and nuts. Arrange the bolts so you can thread the nuts on from the back of the stand. Tighten the nuts and bolts with a pair of needle-nose pliers. PHOTO C: Tiit the tabie saw biade to 13° and bcvel-cut the top and bottom ends of the stand blank. Hoid the workpiece against the miter gauge to make these cuts. O Make the back panel. Lay out the back on a piece of V'4-ir\. oak, using the Back Layout grid pattern on page 181 as a guide for drawing the shape. Cut out the back, and sand the edges until the back panel fits easily into the rabbet on the frame. O Smooth the entire project with 220-grit sandpaper. Apply several coats of clear satin polyurethane, sanding lightly between each with 320-grit paper or #0000 steel wool. Since the frame parts are small, we sprayed the varnish from an aerosol can rather than brushing on the finish. (See Photo E). 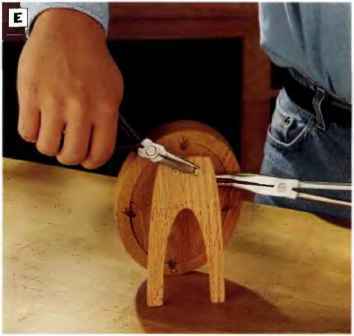 Tighten the nuts with needle-nose pliers. File the bolt ends flush with the nuts. (£) Mount your photo. Remove the frame back and use it as a template for tracing a cutting line onto your photo. Trim the photo to shape, slip it into place and reinstall the frame back.